Tuesday the 9th of August was Census night in Australia. Call me a nerd but I actually enjoy filling out the census form, I get totally excited by stats, and lets not even talk about how easy to use the eCensus was. So when I saw the lovely Sarah from The Science of Beauty had created The Beauty Lovers Census form, I knew I had to do it! How many beauty products dwell in the vicinity of your computer/laptop. Include all products that ordinarily live there as well as any that have not been put away to their correct location. 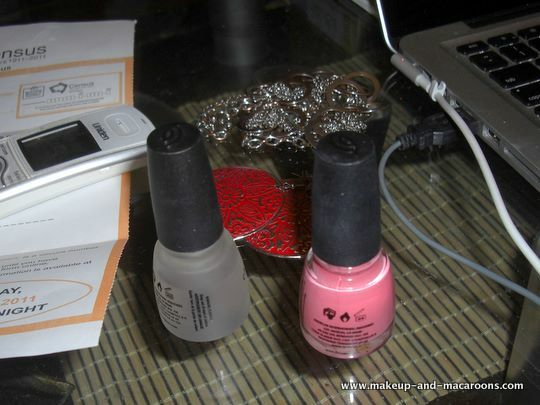 Surprisingly there were only 2 beauty products and 2 accessories near my laptop. Usually the number is much higher. This might have to do with the slight clean up of the house I did on the weekend. What are the names of these products? Please list whether they ordinarily reside in this location. And no, these products do not ordinarily reside next to my lap top. Are these products owned by the person filling out this form? Yes. The other member of the household, i.e. The Husband, doesn't seem to have the need to leave his stuff laying around. On the day of Tuesday 9th of August what beauty products did you use? Is this your normal routine? If no, what is your normal routine? The base is generally the same, but I mix it up with my blushes, eyeshadows and lipsticks. On the day of Tuesday 9th of August what fragrance did you wear? Did you own this fragrance a year ago? Yes... I've been buying a few bottles of these as I actually love this perfume. On the day of Tuesday 9th of August what colour was your hair? Darkest Brown with slightly faded roots. Hence I've purchased a new box of hair dye to colour my hair this weekend. Was your hair this colour 1 year ago? Yes. You may say I'm in a bit of a hair colour rut at the moment. Was your hair this colour 5 years ago? On the day of Tuesday 9th of August what colour were your nails? How long have they been this colour? Since Sunday, but on the night of 9th of August they changed to China Glaze V.
In the week prior to Tuesday 9th of August have you actively researched any beauty products? Not too much... I was on an overseas holiday with very limited access to internet. But when I did get back from leave the first thing I did was catch up on blog reading, so you could call it research! In the week prior to Tuesday 9th of August have you actively received any beauty products? Please note whether they were purchased/won/swap/provide for consideration. Again, due to me being overseas my beauty related shopping/swapping was very limited. Oooh wait, I DID buy a new lipstick on the day of 9th August - Chi Chi Matte Lipstick in Fashion Police. You'll have to wait a few days for a review of this lipstick to appear on the blog. Thanks Sarah for creating this Census form - whoever wants to do it feel free to and post the link the in comments here or on Sarah's blog! And don't forget to check out Sarah's answers... she had a whopping 19 items residing next to her lap top on the night of 9th August. Now that's dedication. Yaay!! Thanks for playing!! That kit nail polish is amazing. I am definitely going to have to invest in some. I do need to say that I am part impressed, part disgusted that you only had 4 products/accessories next to your laptop. Surely a true beauty lover should have a minimum if 10 scattered around their laptops!! I am desperately trying to cconvince myself thats what I am and that I am not in fact a slob! great post, i dont have much next to my laptop. just a few lip balms and a nail polish or 2. i like to keep everything in my room because otherwise i can never find it! SUCH a clever post! Love it! How amazing are the new Chi Chi matte lipsticks?! Can't wait for your review! I got one in "Blonde Ambition" XD Fashion Police was a bit bright for me but on you it's going to look INSANE!! What a great post! Such an awesome idea! Nice post! I like the look of those earrings! hahaha love this! I'm also a nerd who likes filling out the census form haha Was it just me or did the questions not seem as fun as last time?? Thanks for your comments girls, I thought Sarah was really clever coming up with this beauty census! @Hannah - I don't remember last one actually, but I know this yr was so much fun doing it online. Really cool form/tag! :) That lipstick looks gorgeous!! I love yours and I'm following now! That's adorable! love the post.